Large CD storage pages make organizings lots of CDs easy and efficient - simply keep them safe in these ring binder storage pages. Manufactured from strong, CD-safe polypropylene to give your CDs ultimate protection. 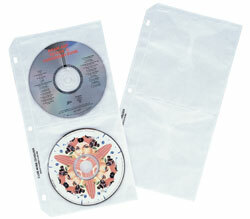 Unique two-sided, non-woven material helps to clean the CD each time it is placed in the holder. CDs can be stored and organized in three-ring binders. Each page stores 8 CDs (4 front, 4 back). 5/PK.